Two artists will share the spotlight in AmadorArts Gallery in Sutter Creek for the month of September. 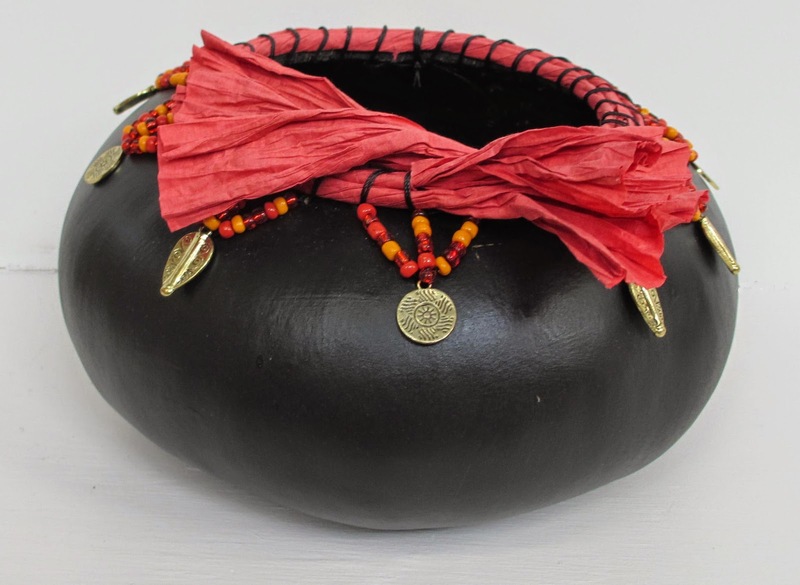 Kathryn Devlin will be showing her ceramic art; Cathleen Berglund will exhibit her paintings. The duo show opens at 1:00 pm during 1stSaturday Art Trek on September 6, with a reception honoring both artists from 3:00 to 6:00 pm. The public is invited. The show and sales continue until September 30th at the gallery located in Sutter Creek, one block off Main St., at 11-A Randolph St. 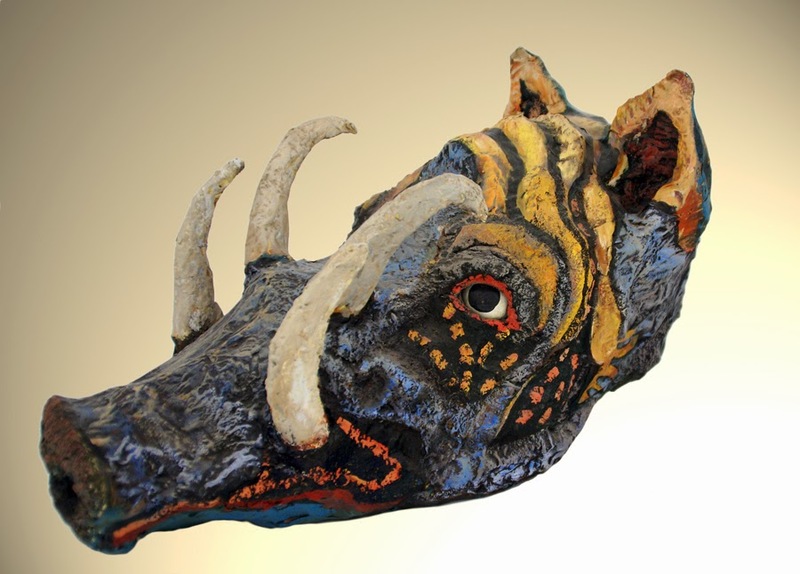 The ceramics of Kathryn Devlin have been described as whimsical, fanciful, detailed, fun, imaginative, childlike, creative. No small wonder that her influence is drawn in large part from her long teaching career spent with primary aged children. Kathryn began her interest in ceramics due to her friendships with fellow teacher, Ken Winebrenner, and classroom aide, Lori Kelly at San Andreas Elementary in 2001. Both mentored Kathryn in the basics of ceramics, working patiently with her as she navigated the world and wonder of ceramics. 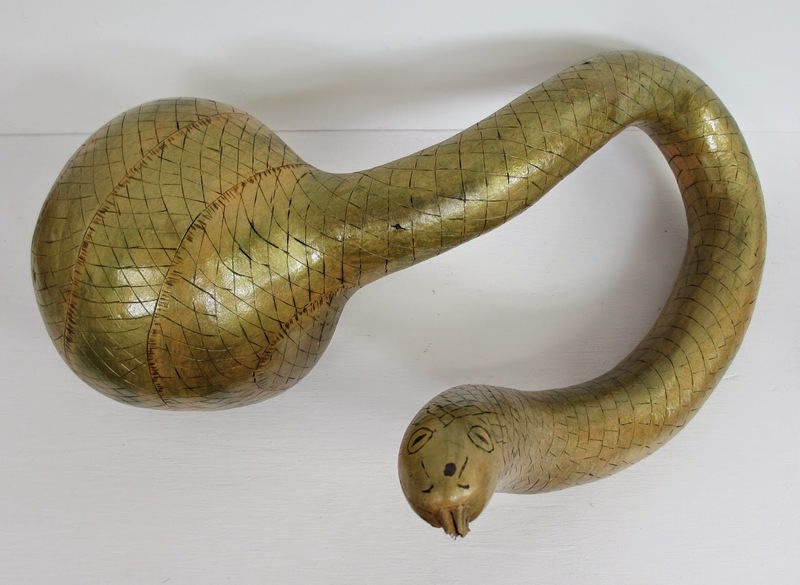 Having had a lifelong attraction to crafts and decorating, Kathryn found her passion of ceramics to be a natural result of her earlier interests. Born and raised in Southern California Kathryn developed a keen sense of observation and could spend hours in her family’s ten-acre orange grove, experiencing all the wonders that lay before her, like the clay that was left after her father flood-irrigated the grove. She was delighted when she discovered she could work the clay, at first making cats which she baked in her mother’s oven and then added rhinestone eyes! So, Kathryn truly has had her hands in clay from a very early age. She taught at San Andreas Elementary for 31 years before her retirement. During her last years of teaching, she was encouraged to show at the Calaveras County Fair. She was hooked. She then began to show at the Amador County Fair and has been a fixture at the Fair every year since 2002 being challenged by entering in the Fair Theme categories. Now the holder of numerous first place ribbons, she is delighted with her growth as an artist. This AmadorArts Gallery exhibit is her first formal show, made especially exciting to be showing with her dear, long-time friend, Cathleen Berglund. Quirky realism, sophisticated primitivism, hard edge sentimentalism: all of these phrases have been used to describe Cathleen Berglund’s style of painting. She likes to capture unique and colorful images, and she favors telling an implied story with her art. Humor abounds in the isolated detail—laundry dancing in the wind, love notes pinned to the post office wall, or garlic buds on the stovetop. 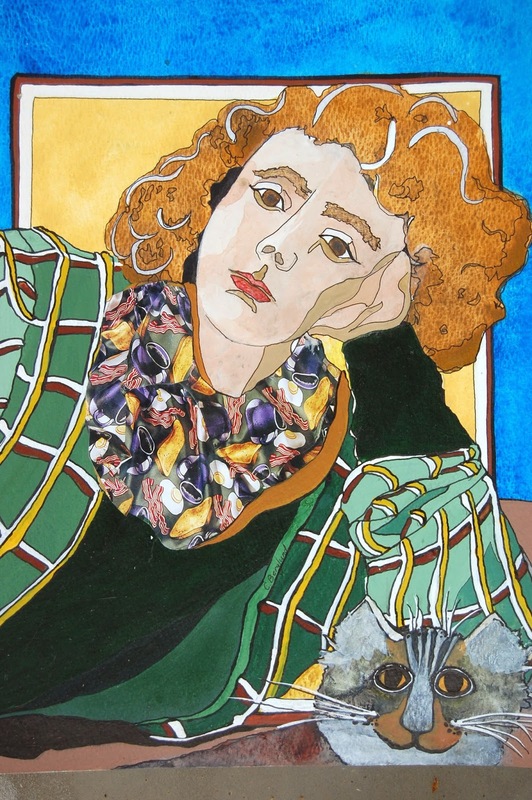 She has the sure hand of an experienced painter with her frank blocks of color, bold outlines and respectful disregard for the “rules” of perspective. A native San Franciscan and now a resident of Amador City, Cathleen Berglund studied art primarily with Maurice Lapp at Santa Rosa Junior College. Her distinctive paintings, drawings, and sculptures were first shown in Sonoma and Mendocino county galleries in the late 1970s. Her art has appeared in the Mendocino Art Center Gallery, Artrium Festivals in Sonoma County, the San Francisco Art Festival, The California State Fair Art Exhibit, and in her own gallery on Orcas Island, Washington. She has had one woman shows in the Santa Rosa City Council chambers, private galleries in Santa Rosa, Locke, Minneapolis and in Sutter Creek, including Gallery 10, which she co-founded almost two decades ago with nine other local women artists. Her art can be found in private collections from the west coast to Australia. She has recently illustrated two books of her poetry, written as “Mrs. 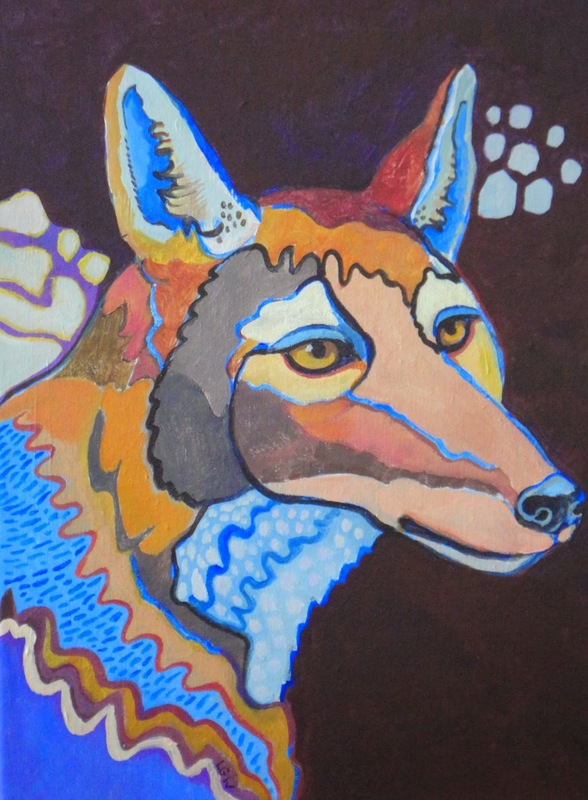 Coyote.” The poems offer a four footed, poignant and humorous view of life, similar to her painted subjects. 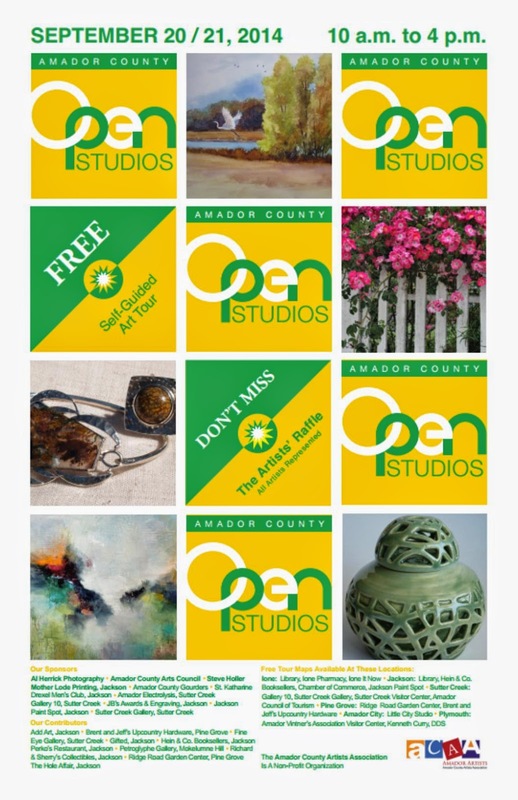 The AmadorArts Gallery is open weekends 1:00 to 4:00 pm and weekdays 9:00 am – 2:00 pm, except Wednesdays. It’sadjacent to the historic Monteverde Store Museum and well worth the short walk off Main St. to see the monthly shows each featuring unique local artists. 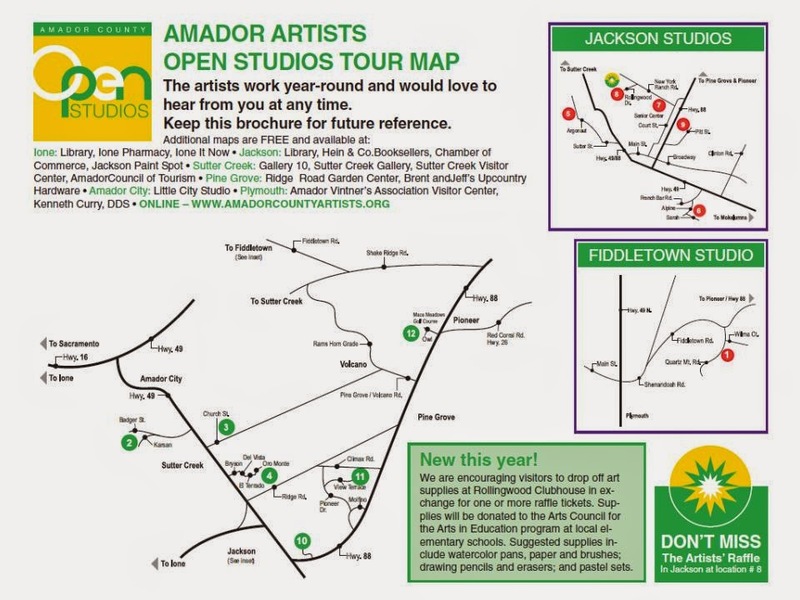 Visit www.amadorarts.org or call 209-267-9038 for information. Kathryn Devlin with many of her ceramic creations. Examples of the work by Cathleen Berglund. 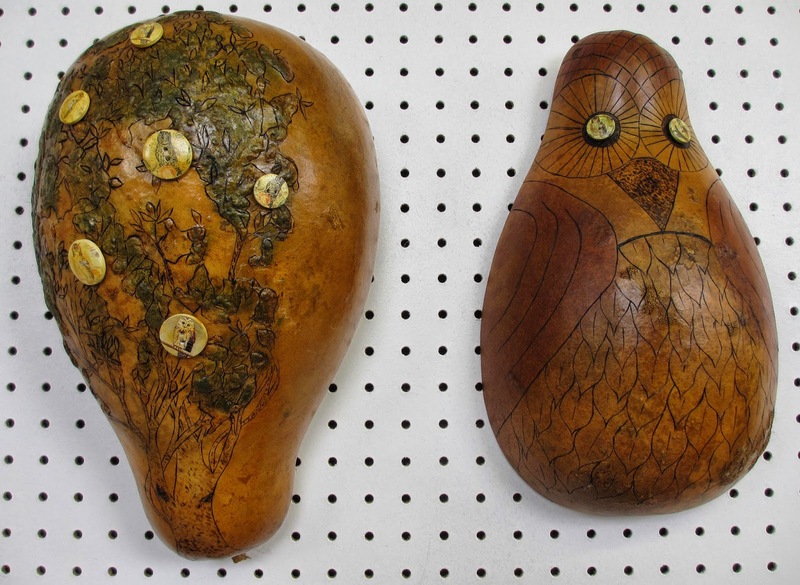 Laura Carpender, fiber and gourd artist, has discovered a way to combine the two media. As she explained, “The contrast between the soft fabrics and fibers and the toughness of the gourds is exciting and has endless possibilities.” The variety of art Carpender fashions will be featured at Sutter Creek Gallery for the month of September. Since she was three years old, Carpender has been creating with fiber and fabric when her Grandmother gave her a needle and cloth to make doll clothes. She has won numerous awards for clothing, weaving and quilting designs. Recently she won 18 ribbons at the Amador fair for her home arts. For two years, she taught quilting at an Arizona community college. Carpender is a member of the Del Oro Spinners and Weavers Guild as well as the Amador Gourd Patch. She has been weaving for about 15 years, spinning for over 30 years, and working with gourds for about 3 years. During her thirty years as a social worker, Carpender found the only way to save her sanity was to create art every day. 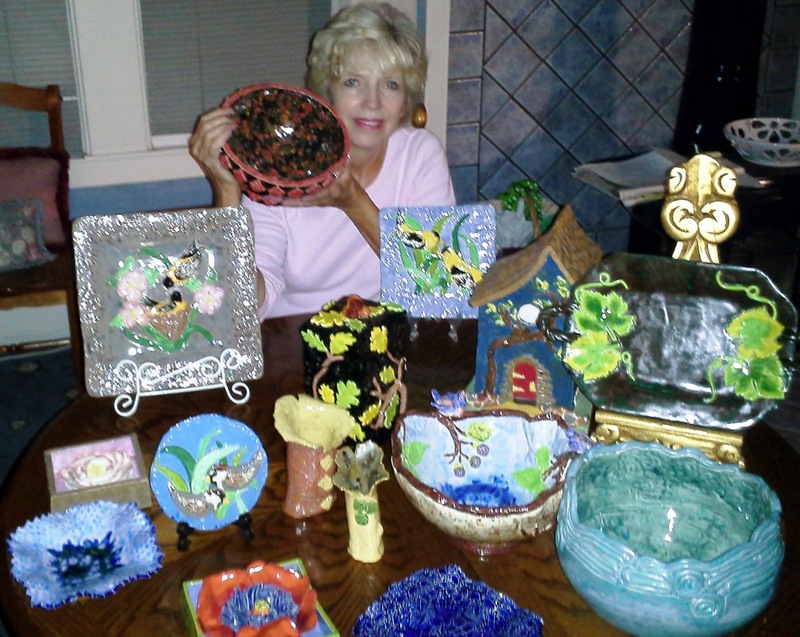 Now that she is retired, she devotes hours each day to her designs. She is inspired by the work of others but manages to find her own way. Whether spinning yarn, painting gourds, weaving fabric or sewing quilts, Carpender is happiest when creating one-of-a-kind art. "There are so many different ways to approach art that it is a never-ending source of excitement and challenge," she said. For example, she has used the yarn from an unraveled sweater to decorate gourds, recycling and innovating at the same time. 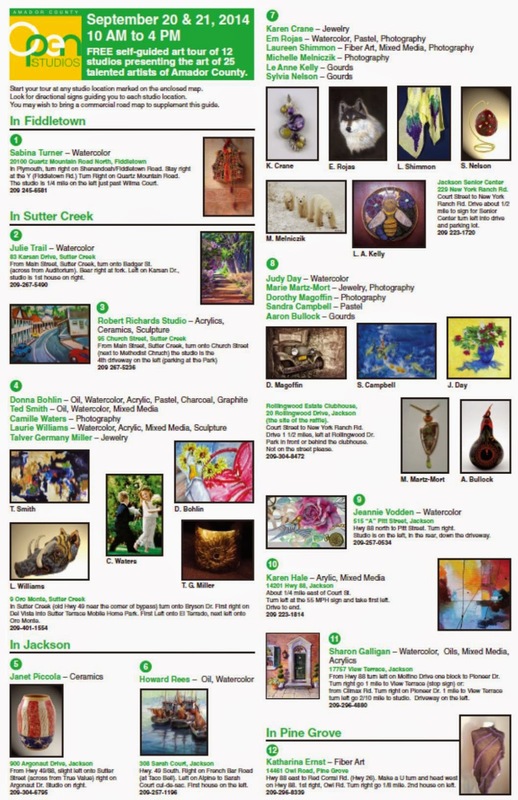 Two artists will share the spotlight in AmadorArts Gallery in Sutter Creek for the month of August. Sandra Campbell will exhibit her works in pastels; Catherine Woodruff will be showing watercolors and other works in collage. 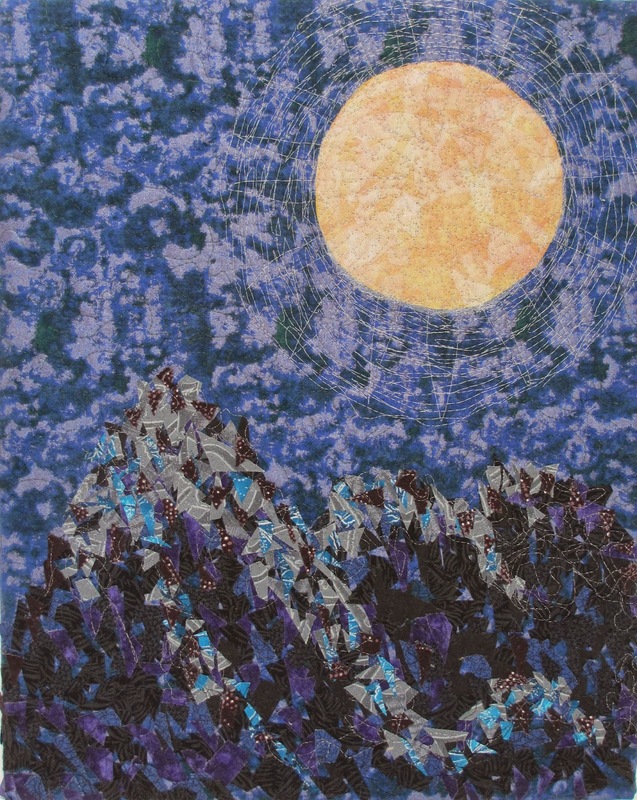 The duo show opens during 1st Saturday Art Trek on August 2, with a reception honoring both artists from3:00 to 6:00 pm. The public is invited. The show and sales continue until August 31st at the gallerylocated in Sutter Creek, one block off Main St., at 11-A Randolph St.
Sandra Campbell always had an interest in art, just not the time, so she incorporated the arts—mainly theatrical and visual—into her middle-school English classes at every opportunity. After retirement, she enrolled in college classes in drawing, watercolor and the use of colored pencils. Then, she for three years she studied with the late Thelma Davis and discovered that she enjoyed wielding sticks of color more than a paint brush or pencil. 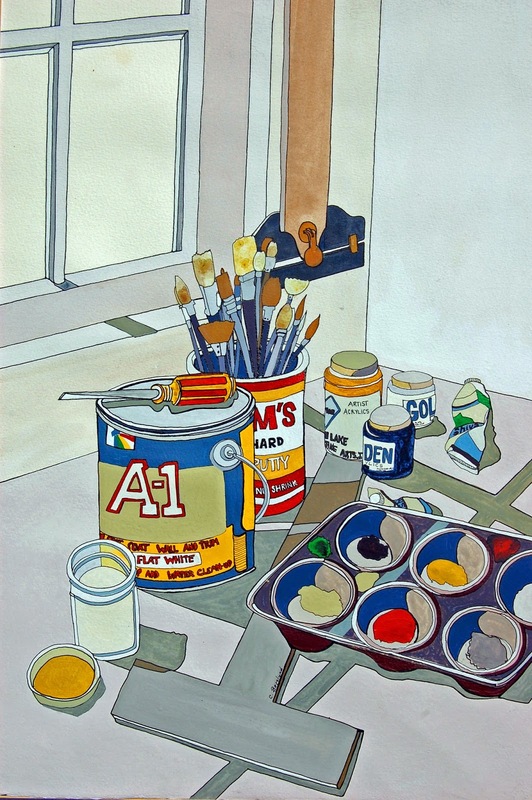 She took more workshops by pastel artists including Gil Dellinger, Clark Mitchell, and others, as well as additional college classes in pastel painting, design, art history, and most recently, collage and assemblage. “When people hear the word ‘pastel,’ they may think of soft colors,” Campbell explains. “But what attracts me to this medium is the possibility for vibrant oranges, brilliant yellows, and intense purples and reds.” Her subjects include landscapes, florals, animals, and her travels, generally representational but often with intensified colors. 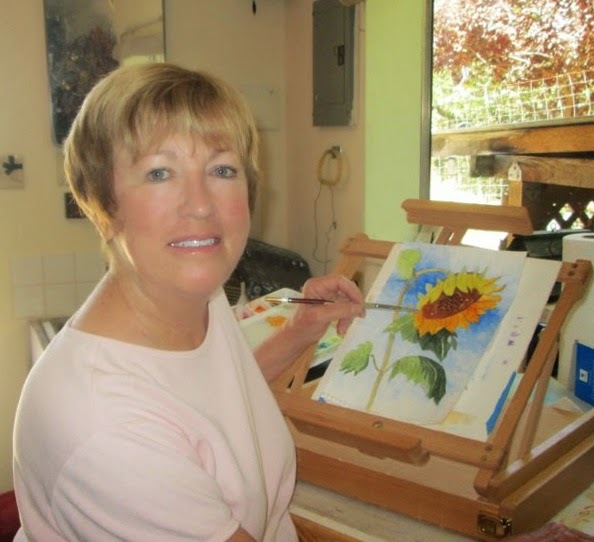 She is a member of the Sierra Pastel Society and the Amador County Artists Association through which she has participated in the annual September Open Studio tours. 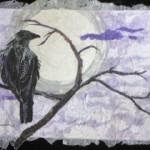 Her work can also be seen at the Sutter Creek Gallery. Catherine Woodruff’s first love is creating in watercolor, because as she claims, “the paints are unpredictable and can produce beautiful effects.” But she also work in collage. She moved to Sutter Creek from San Diego and has found retirement especially rewarding due to the classes she took from established local artists like Howard Rees, Sabina Turner and Lynn Slade. She’s been an active member of the Amador County Artists Association for 10 years and has just recently become one of the Featured Artists at Gallery 10 in Sutter Creek. The AmadorArts Gallery is open weekends 1:00 to 4:00 pm and weekdays 9:00 am – 2:00 pm, except Wednesdays. It’s adjacent to the historic Monteverde Store Museum and well worth the short walk off Main St. to see the monthly shows each featuring unique local artists. 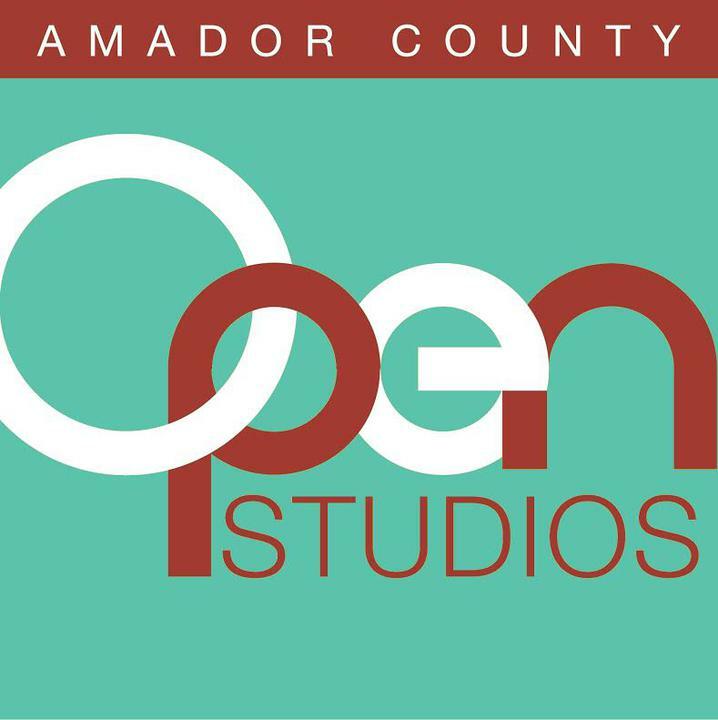 Visit www.amadorarts.org or call 209-267-9038 for information. Animals, both wild and domestic inspire Laurie Williams’ art. “Since early childhood I have loved animals,” she said, “and have made them the subject of my paintings and sculptures.” Sutter Creek Gallery’s featured artist for August grew up on a ranch which allowed her the opportunity to learn about the goats, horses, deer and other creatures which are the focus of her art. Each year at the county fair, Williams sits in the animal enclosures making life drawings, which are later turned into bold-colored acrylic paintings or clay and papier mache figures.